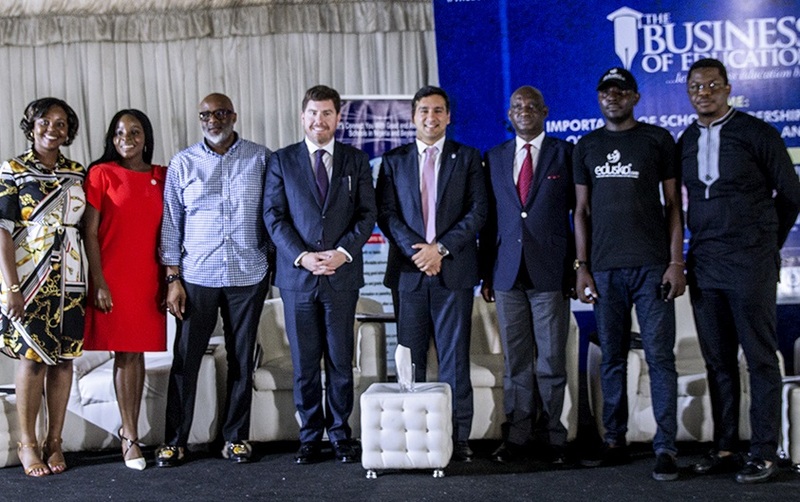 (L-r): Binta Bhadmus, compere; Folawe Omikunle, moderator; Lanre Olusola, panellist; Darrell McGraw, panellist; Raghav Lal, panellist; Dr. Adebodun Sanyaolu, panellist, Jide Ayegbusi, convener and Oscar Gbemilek, in a group photograph at the summit. Edusko, a leading edtech company, hosted hundreds of school leaders across Nigeria in its maiden edition of the Business of Education with various thought and business leaders sharing wealth of experience with the school leaders on how they could improve on school outcomes through inspiring leadership. In his welcoming address, at the summit held recently in Lagos, Jide Ayegbusi, the convener of the summit reiterated Edusko’s commitment to impacting the Nigerian education sector through programs and initiatives that can help its partners manage their schools better as well as help parents who regularly use Edusko’s online platform to find good schools, make better choices for their children. “Some have asked us why this event is free for the participants. Our simple answer is, the best things in life are free. This is our own little way of impacting the education sector and key stakeholders in it. Together, we can make the education sector and system great again,” said Ayegbusi. Professor Chris Ogbechie, the keynote speaker, of the Pan-Atlantic University, Lagos, told the audience that today’s parents take a closer look at the quality of school leaders before making school choices. Afterwards, Mr Lolade Adewuyi, founder, CampsBay Media shared the importance of schools increasing sports participation to grow the leadership potentials of their students while also helping to develop the sports business ecosystem. “Engaged students mean fewer agitations and unruly behaviour. Active students mean stronger bodies and less time spent in the sick bay. More sport means more business for all,” Adewuyi said. In the panel discussion, Mr Lanre Olusola (The Catalyst) mentioned why school leaders should change with the changing world. “Everything is changing, teachers, therefore, have to change the dynamics of how they teach”, he said. Olusola went further to say that parents ought to complement the work teachers are doing at home. Reiterating, Raghav Lal, CEO of The Transnational Academic Group said what is working well for schools are teachers and parents who work hand in hand. Others on the panel were: Mrs Biola Alabi, founder, Grooming for Greatness and Biola Alabi Media; Dr Adebodun Sanyaolu, CEO Adkyke Consulting and Darrell McGraw, partner, PriceWaterhouseCoopers Nigeria. Edusko was launched in 2015 to help private schools across Africa become more accessible and at the same time help parents make informed school choices despite their busy schedules. At the moment, over 4,000 leading schools are listed on the platform and close to 10,000 parents have used the platform in the last one year to place their kids in suitable schools. The company has a presence in over 30 states in Nigeria and more than 10 regions in Ghana.